Up to now, the development of space systems was mainly driven by global or regional needs or sovereignty missions. The global dimension of satellites fits perfectly the needs of customers requiring a wide coverage: meteorology, TV broadcast or navigation systems are typical examples with well-structured users communities. Customers invest in a proprietary capacity or in a significant part of the infrastructure. New trends shape or disrupt today's landscape: the budget constraints weaken this model. At the same time, new players, either not involved before in the space business (for instance the so-called GAFA for Google, Amazon, Facebook and Apple) or growing in new countries, are launching ambitious, disruptive but credible initiatives, as demonstrated by Elon Musk and SpaceX. The dynamism and ambition of the new space economy in the Silicon Valley. The come-back of the “usual suspects” on the export market: they are affected by this first trend but also by the pressure on institutional budgets. At the same time, the new operational needs are challenging (e.g. very high resolution imagery, real time and persistent surveillance of wide areas, high speed Internet) and require complex and dedicated capacities, while the users demand is often fragmented and spread over the world. Future high performance systems will require collective approaches with capacity sharing. So far these collective solutions have been hampered by the reluctance of governments to share exclusive and sovereign responsibilities. The current evolution confirms also the importance of a strong institutional support, even for activities which are considered as « purely commercial ». A level-playing field is still missing, with a very unbalanced situation between the European and the US « ecosystems »: the weight of US institutional and defence markets still provides key competitive advantages in the worldwide competition and is a strong driver of the new space economy, often wrongly perceived as commercial activities. How can Europe and its Member States secure its non-dependence and develop its own space policy? How can Europe Space Industry improve its competitiveness in order to play a leading role in the worldwide competition ? Space policies are originally based on principles defined by the United Nations (e.g. declaration of Legal Principles Governing the Activities of States in the Exploration and Use of Outer Space). Space activities entirely driven or controlled by nations was the initial model. This assumption was a good one until very recently: even in the sector of space telecommunications, the main providers were initially governmental or intergovernmental consortia. The role of the private players in the development of space infrastructures was not at all anticipated. For satellite navigation, in Europe, after the breakdown of concession contract negotiations, the Full Operational Capability phase of the Galileo programme is funded by the European Union. For a long time, Earth observation (EO) has been a pure public investment. In the United States, the role of the private sector in EO was introduced into the space policy when the US position switched from a public ownership of the EO satellites to the promotion of US space industry. The words « industrial competitiveness » and « economic opportunities » appear in the Presidential Decision Directive N°23 in 1994. In France, Spot Image is created in 1982 as a public limited company owned by the French Space Agency (CNES), the French Mapping Agency (IGN), and Space industry: Spot Image will be the commercial operator of the Spot satellites but, from Spot 1 to Spot 5 and for the twin satellites Pleiades, the investment in the infrastructure is nearly fully funded by public money. A first evolution of this model started with Spot 5: Spot Image has funded the ground segment and has contributed to the funding of an additional payload, the HRS instrument for stereoscopic imagery and digital elevation models. Spot 6 and Spot 7 are the first world examples of EO satellites funded by the private sector without any strong commitment of institutional organizations (data buy or capacity buy). Nevertheless, thanks to the US political willingness, the world leader in satellite imagery is a US company: an important proportion of DigitalGlobe revenues comes from large framework contracts with the National Geospatial-Intelligence Agency (NGA). These precursor contracts have acknowledged the role of private actors in the funding of the space systems. NASA Commercial Resupply services and the development of « commercial » options for NASA missions has confirmed this heavy trend and accompanied the investment made by SpaceX. Compared to this move towards an increase participation of the private sector, both under private public partnerships or through private initiatives, Europe could improve the way it contributes to the long term continuity of National and commercial missions. The direct consequence of the difference of size of the domestic markets is a biased competition between European and US industry and service providers. Up to now, for the space applications domain, the development of space systems has been mainly driven by sovereignty missions, global or regional needs or scientific research. Space technologies have been exploited for defence use for many years. Until recently, these military systems were implemented through dedicated, proprietary and mainly national missions. Requiring a global or regional coverage, meteorology, operational oceanography, TV broadcast or Global Navigation Systems are other good examples in the civil domain. In those domains, the communities of users are also well structured. They are ready to share the investment in a large system and committed to ensure the continuity of the infrastructure. The best example is the meteorology, with, the creation of Eumetsat, in the frame of the World Weather Watch. The budgetary constraints affecting many countries weaken the « old model ». The international competition is increasing, not only between the usual champions but also against new comers, more and more active on their own market and on the export market. « new space », not always so commercial as claimed. New operational needs are challenging (e.g. real time surveillance of wide areas or very high resolution) and require dedicated capacities, while the users demand is fragmented and spread over the world. Many institutional programmes face programmatic issues, delayed or difficult decision-making because of the budget constraints. But these constraints can trigger opportunities, such as the development of service activities and innovative agreements such as the Public Private Partnerships (PPP). Skynet is a good example with the transition from proprietary solutions owned by the governments to framework service contracts. In Europe, using the synergies between the institutional needs and the commercial markets is yet at a very emerging stage: the Spot 6 and Spot 7 satellites have been fully funded by Airbus Defence and Space, without any commitment on data buys or capacity buys by the main institutional customers. Thus, the sustainability of the private initiatives in Europe is not guaranteed as European public users do not participate to the funding of these missions. This is a threat for the industry but also for the users of these capacities. New operational needs are challenging (e.g. real time surveillance of wide areas) and require dedicated capacities, while the users demand is fragmented and spread over the world. A typical example is the risk management domain and in particular the emergency response, with high-grade requirements not easily covered by the general purpose missions. The cost of investment in the infrastructure can’t be justified without the aggregation of a wide users’ demand. Another example is the monitoring of air traffic and shipping routes. The market of space applications is thus facing a general challenge regarding future growth: cost-effective solutions can be developed and operated only if the user base is consolidated. Addressing these fragmented markets will likely be the main growth opportunity in the coming years, while usual domains are becoming renewal markets. Building a new mind-set with a more collective approach remains obviously a major challenge, as demonstrated by the long way for the operational implementation of the Copernicus programme at European level. The acceptance of the « mutualisation » of needs, implying to put aside some very specific or local requirements, is a difficult exercise for users. Also for the providers of space infrastructures, used to work in a B2B or B2G context with a small number of large customers. Customers of space systems were able until now to buy legacy space infrastructures: a small number of industrial players work for a small number of customers at national or international level. The « usual suspects » are mainly public organizations or large private operators: space agencies, communication operators, specialized organizations such as Eumetsat or NOAA, ministries of defence and, last but not least, the European Union. Common elements shape the family portrait: structured organizations, able to define harmonized or homogeneous requirements, with a high influence on product specification because they pay and a high level of awareness of space capabilities and internal expertise. This market has reached maturity or even saturation. Its evolution, in the best case, is a « renewal » market. This trend to stagnation or even recession is fostered by the main reasons described above. Two additional explanations are the increasing reliability of satellite products (lifetime) and the number of competitors compared to the number of customers (pressure on prices). 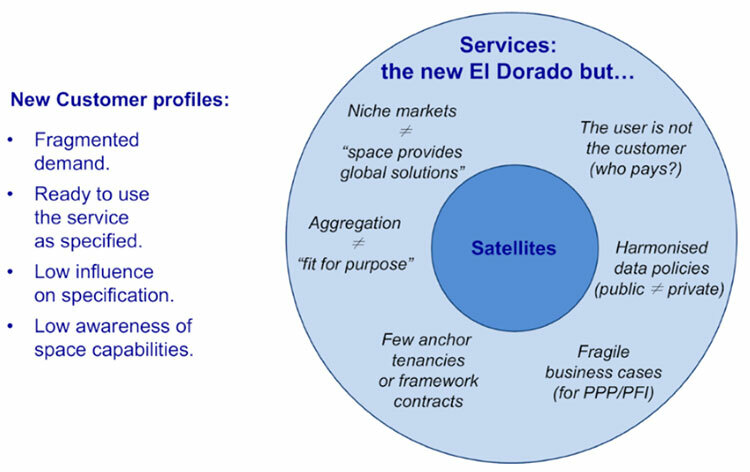 Space services: the new El Dorado? The development of services is the first answer to mitigate the stagnation of the traditional markets. It’s also a key condition to secure the future funding and the continuity of space infrastructure in the case of systems paid with public money (e.g. Copernicus): policy makers want the proof of the societal benefits and impacts of the public investment. Typical customers of services are specialized agencies (EEA, EMSA, etc.) and public institutions using space services for their own missions, value-added companies, local or regional authorities, network operators. Often ready to accept the service as specified by the provider. With a low influence on product specification. And only few awareness of space capabilities. The provider shall manage the fragmentation of the demand and cope with niche markets. The business cases in Europe are fragile with few anchor tenancies or framework contracts. The required skills and competencies are specific: profiles are different from those needed in the manufacturing industry. The development of services raises a very specific question for the long term continuity of the satellite infrastructure. There are many options: participation of users to the cost of the infrastructure or free-rider model, capacity sharing, anchor tenancies, etc. Often, interesting contractual models can’t be implemented because of the existing procurement rules of governments and European institutions. The development of services, a new El Dorado ? The so-called « free-rider » issue is often identified as the main risk affecting public goods: users can take advantage of public goods without contributing sufficiently to their creation. The difficult decision-making related to the continuity of the space infrastructures, such as the Copernicus infrastructure, with its core components and the contributing missions, or the SPOT 5 family, are two good examples. Most of the existing services based on earth observation satellites take benefit of this « free-rider» position: the cost of the depreciation of the space segment is not included in the cost of operation. The major drawback is the fragility of the business model and the dependence on external decisions for the renewal of the main data sources. Furthermore, the risk of discontinuity is probably one of the reason for which operational users are not ready to rely on space services for their critical needs. included in the cost / benefits analysis: these benefits are not expressed in economic value. For instance what is the value of the reduction of diffuse pollution or reduction of N2O emissions by enhanced agricultural practi-ces enable by Earth observation satellites? The « free-rider » model is a major risk in Earth Observation: for Copernicus, high resolution imagery is bought by institutional customers from European or non-European satellites, provided only that the image reseller is based in Europe. Innovative procurement schemes, compliant with the international trade agreements, shall be defined, when national or commercial infrastructures are at stake. The overall coherence of the data policies shall be improved, balancing the interests of the users (free flow of information, low prices) and data owners (IPR protection, prices covering the full cost of operations and investments, continuity of investment). access to the space infrastructure and the commercial development of the service sector. Assessing the return on investment for the taxpayer is difficult, implying a full understanding of the value chain and the indirect or hidden benefits or beneficiaries. The European Global Navigation Satellite system, with Galileo and EGNOS, is a good example of a complex value chain. Private funding: operators invest in legacy infrastructures in order to provide services to their customers. Except for the web actors working with a hybrid B2C-B2B model, the users pay the service at a market price. Cost of investment in space systems result in a rather small number of large players controlling the offer, close to a situation called « oligopoly » by economists. A key success condition is the existence of common rules in the access to market. The best example is the satellite communication market. Applying this model to the EO worldwide market is a challenge for the reasons explained before (distorted competition). The availability of affordable solutions for the access to space means that these private initiatives are at least partly subsidized, as the investment in launchers is mainly public. Public-private partnership (PPP): this model seeks a balanced contribution of public and private money, as well as mutual benefits for the public users and private customers. There are many examples in Europe: highways, global utilities (water or electricity distribution) or terrestrial networks. 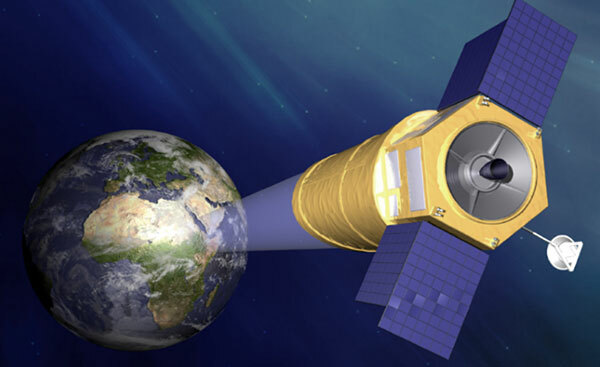 For space projects, the Public Private Partnership model is often associated with the failure of the Galileo concession project in 2004-2007. The transfer of risks (technical challenges, market uncertainties and competition with the free GPS) is identified as the main cause. Skynet 5 program is a typical example of successful PPP. Innovative solutions mean not only new technological developments but also new business approaches and schemes for new governances, ownership or cooperation schemes for the operation of future space infrastructures. New potential customers can be global or regional actors, whose specific needs are not fully covered by service offers. Typical examples are oil and gas industry, the utilities and network operators, energy suppliers and… the usual suspects. Evolution of the customer demand from services to new models: this applies for instance to customers having experienced service offers but looking now for high performance custom-made solutions. Capacity brokers are typical examples. Evolution of the customer demand from satellite infrastructure to new models: in this case, the new model is triggered by budget cuts or debt constraints. These new models or the new space can also have a positive impact on the core business: improvement of process, standardization and modularity, systematic approach instead of case-by-case studies, etc. This evolution requires obviously a new paradigm, not only on the manufacturer side but also on the customer side: a new mindset (cooperation and multidisciplinary approaches) and new skills (with evolution from B2G to B2B and B2C). Working together: not easy ! Incentives for cooperation, as seen from third countries, are mainly linked to achieving goals that are technologically or financially out of reach for one country alone. Mutual interest shall be identified and evaluated in terms of benefits and areas of influence. Space contributes to the implementation and enhancement of mutual intergovernmental understanding, by providing sufficient political and diplomatic perspectives to be shared in the international environment. While the main usual drivers of any space policy are defined according to national interest priorities, affirmation of sovereignty and search for leadership, the unavoidable need for cooperation in space will have to go through many challenges. When defence and security issues are at stake, the control of the dissemination of information is often quoted as a constraint impeding any synergies with the civilian domain. As a matter of fact, as potential users of the services are institutional users and have similar constraints on the control of the dissemination of the information, it should help to define a coordinated concept of operation with shared means. Emergency response and security missions are good candidates for the implementation of shared capacities: the raw Earth observation images are not often used in the final geo-information product. Beyond the data policy and the protection of the rights of the image owners, this feature can help to manage the issue of confidentiality of some satellites sources. The decision-making process for large international projects is always complex, in all domains. Except for science missions, the space domain is particularly difficult: so far collective solutions have been hampered by the reluctance of the governments to share exclusive and sovereign responsibilities. But, once decided, international initiatives are very robust, as demonstrated with the International Space Station. While having experienced many difficulties in national debates, the project won its resilience from deeply committed international engagements, relying on shared recognition of national benefits. Both the size and the complexity of such unique projects may sometimes act as incentives for nations looking for long term benefits in very diverse domains, well beyond the specific objective of the programme, provided the projects show a right balance between ambitions and affordability. As already demonstrated for meteorology (with the cooperation between Eumetsat and NOAA on the Joint Polar System) and oceanography (with the Topex-Poseidon and Jason family), international cooperation plays a major role for some applications. The successful implementation of large capacities depends on the cooperation between two, three or more stakeholders and is always a lengthy process based on mutual trust. The operational use of earth observation capacities in the security domain is one of the most promising but also most challenging developments which have been undertaken during the last five years at European level in the context of Copernicus/GMES (Global Monitoring for Environment and Security). Beyond the R&D and pilot projects, the evolution towards operational systems is difficult. There are complex technical issues, for instance regarding the very high resolution and the responsiveness, but the key challenges are mainly related to the organization and governance of these systems, combining national assets such as Pleiades, Terrasar-X and Cosmo-Skymed with strong concerns on the control of the dissemination of the information. Various management procedures at national level, ranging for example from military to commercial programmes with intermediate models based on the dual-usage of some systems. This heterogeneity is reinforced by the existence of non-space systems providing complementary capabilities that must be taken into account when designing large systems (financial participation, exchanges of data, access and control rights). Different technical approaches that have direct impacts on governance, operational procedures and data policy. In particular, a key role given to the commercial operator in the management of a wide range of issues (sometimes usually dealt with at governmental levels) via adapted legal frameworks may require adapted mechanisms. The operational environments and constraints, whether based on international regulations or on national regulations and laws supported by specific governmental policies, may add to this global complexity. Shared capacities will have to rely on a better mutual knowledge of national user communities. Also, by structuring and standardizing the demand, these initial cooperation agreement may pave the way for more collaborative and streamlined space systems, while making the best from existing systems at national level. Private and public actors: how will be the new ecosystem? Option 1: privatization of space. Option 2: space remains under the control of nations or public bodies. The most complex systems are either owned at community level or based on shared capacities. Option 3: the ownership is shared between the public and the private sectors. More and more start-ups and small and medium size enterprises (SME) are betting on the development of very small satellites, not only for technology testing and education but also for operational missions. The big players of the Web sphere are increasingly interested by Space and able to invest massively, either: Elon Musk with Space X is the most famous example but Google and Facebook announced recently their own initiatives. The big players with a start-up spirit are the very impressive ones: a scalable business model able to impact more than one billion customers, aggressive and agile solution to lower or break the entry barriers of the targeted market. They have a huge cash capacity. In June 2014, two major announcements were made by Google Inc.: an agreement to buy Skybox Imaging for $500 million in cash and a second initiative to launch the World's largest constellation. In March 2014, Mark Zuckerberg confirmed that Facebook’s Connectivity Lab was working on Free Space Optics, a form of infrared laser that transmits information via light. In April, SpaceX announced court Action to open Air force space Launch mission to competition. The most significant initiative is Oneweb with a massive constellation of several hundreds of small LEO satellites providing high speed connectivity. Either from startups or major actors, these initiatives have common features. They are launched by private actors, even when supported by public money or public orders. Even if not based in California, they apply also the Silicon Valley recipe for success. They are always very fast and agile, proposing scalable systems and are convinced that their dream will become a reality. The validity of the business plans is perhaps questionable, in particular when one has in mind the failures of the attempts to develop the first constellations of satellites (Iridium, Globastar, Teledesic, Celestri), but, as a matter of fact, the new entrepreneurs are able to raise funds and sign strategic partnerships. control of the information chain and distribution networks, raises critical issues for the governments and states: if the recent global initiatives are actually implemented, privatization of space and vertical integration of the information chain by a limited number of dominant companies would mean a loss of control and a reduced role of governments and agencies. What are the benefits? What are the risks? Answering this question implies the analysis of a wide range of issues between the neutrality of Internet and the impact on these new schemes on democracy and goes well beyond the scope of this paper. The vertical integration of the information industry would at least affect the network operators (space and ground) but will also drastically change the role of space industry (prime contractors and equipment suppliers) and the role of space agencies. The second scenario is related to the large and complex space infrastructures with a regional or global coverage. Meeting the ambition or performance requirements of large systems, exceeds the capacity of a single country, can thus justify a collective approach with capacity sharing. The adage « full property = full control » can be replaced by innovative schemes offering a good balance between proprietary assets and collective assets. Beyond the budgetary issues, the main question is the agreement on the governance rules and the operational concept. A first example is the Copernicus programme with both specific missions (the family of Sentinel satellites) and the contributing missions owned by the Member states or by private operators. One can highlight the complexity of finding an agreement for a security core service. A second similar example is the Tsunami Warning Systems (TWS) developed at regional level in the Indian and Pacific oceans regions. 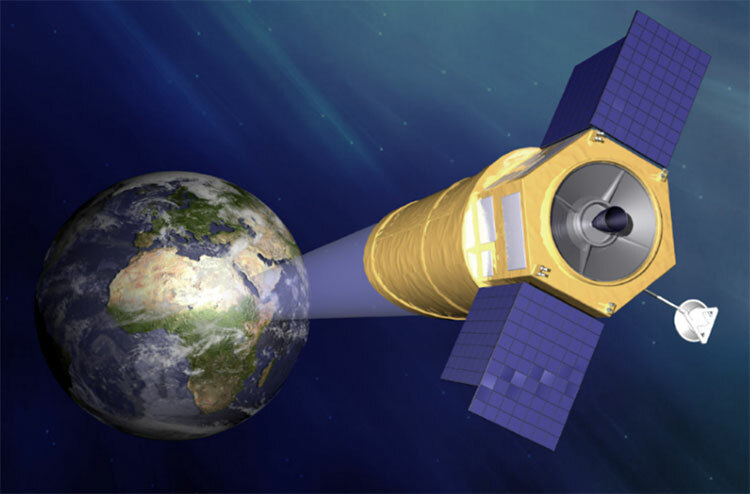 A third hypothetical example is the case of future systems based on a single large space asset, such as the Geostationary Optical Observation System (GO3S) proposed by Airbus Defence and Space. GO3S is a new persistent observation system, providing 14 hours per day of optical imagery, video capability, detection of moving targets, very fast response time (minutes) for near real time observation/monitoring. The typical example is the hosted payload model: a payload in orbit for a fraction of the price of a dedicated mission, even if this price is proportionally higher. If a clever contractual arrangement overcomes the complexity of a multiplayer game, hosted payloads could become a serious design option for institutional or even military programs constrained by budgets. Coherence between the complexity of the decision-making and private investment rules, in the context of long lead time and complex R&D, schedule and timeframe. Risk-sharing models between private and public actors. A possible evolution of the hosted payload model is a disruptive solution called the « platform as a service ». The satellite platform becomes a commodity. 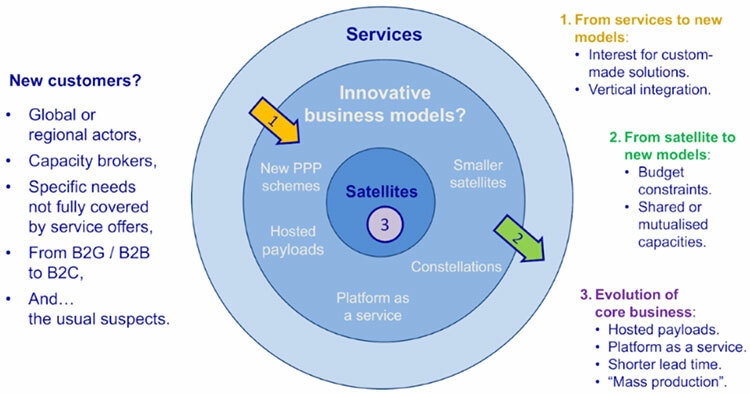 In this new commercial model, all payloads are hosted on a shared platform or a constellation of satellites operated by the « platform operator », with several benefits (opportunity of shared investment, revenues from platform operation, etc.). Not realistic? Not so sure… One can yet see unanticipated and fast evolutions, which would not have been possible a few years ago. A typical example in the security domain is CHIRP (Commercially Hosted Infrared Payload). Even if it was an experimental payload, the decision of the US government to build this early warning mission as a hosted payload on a commercial telecommunication satellite (SES-2 launched in September 2011) demonstrates a major change of the mindset. In a next future, this option could become a solution for the augmentation of capacity of the nominal systems. Public investment, private initiatives, something in between… In a changing world, the future of space industry in Europe will depend on the extent to which public and private investments will coexist and mutually benefit from each other and on the capacity of the European industrial actors to take a seat in the « new space » economy. Thanks to the support of space agencies, European industrial actors have proven their excellence on challenging scientific missions and their competitiveness in the worldwide market, even without a level-playing field. Recent success stories on the export market confirm the importance of a strong and sustainable institutional effort supporting the competitiveness of the space industry. Making the best use of scarce financial resources requires an in-depth understanding of the private and public business models with policies and rules fostering these innovation schemes, as done today in the US. Many instruments and PPP schemes exist: anchor tenancy, bulk procurement, investment capacity, hosted payloads or shared capacities, etc. During last 5 years, more than $2 billion were invested in new space business by world-class investors. DFJ, Koshla Ventures, Founders Fund, Paul Allen (co-founder of Microsoft), Jeff Bezos (Founder & CEO of Amazon), Elon Musk, Larry Page (CEO of Google), Eric Schmidt (President of Google) are among them. 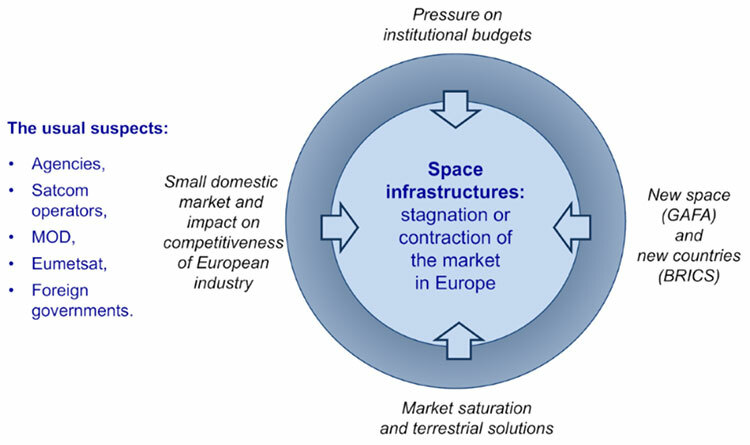 If both competitiveness of the space industry and European non-dependence are identified as two strategic objectives, European policies shall evolve to reinforce the support to the private sector investment in space infrastructures. It shall cover all components of the value chain, from satellite manufacturers to satellite operators and services providers. The new economic context can be the opportunity to implement innovative options solving the governance issues, the most complex ones, before technical performance and budgets. The first lessons learnt from Copernicus confirm that the readiness to mix institutional and commercial activities is rather low in Europe. In a very wide perspective, the challenge for Europe and its member states is also the acceptance of a new mindset with a transition from assets owned at national level and partly interoperable to truly shared systems. This challenge is primarily for institutional actors, both at national and European levels. It implies a major cultural change in the way public procurement and domestic markets are managed in Europe, enabling the emergence of a small number of European champions. It’s still a long way to the level-playing field in a harsh international competition: US industry faces also budget cuts on its domestic market and comes back on the export markets. New comers, either from new space countries or new entrepreneurs applying the Silicon Valley cooking recipes, are becoming very serious players and, if successful, their approach will change the game. Europe has a specific industrial, financial and institutional landscape, with many assets that are the outcome of national and European policies. Dual use between military and civilian applications, in domains where the operational requirements and information dissemination constraints can be reasonably managed. Mixed and consistent models between institutional and commercial initiatives. Smart combination of proprietary systems and shared capacities. Enhanced integration between national and European systems and assets. Addressing the most complex operational missions will likely be one of the main growth opportunities in Europe in the coming years and a unique way to stay on the leading edge of technological excellence. It’s a key condition of success of the European space industry in the global competition. This future success is also a requirement to maintain an independent or autonomous European capability in support of public policies. It would be a major mistake to consider that industry competitiveness is not a cornerstone of non-dependence and sovereignty.